When Alan Turing demands in an early voice-over that we “pay attention” to what we are about to see, it is less a plea to notate intricate details and more a statement on the behavior we come to witness. This is not a man marching to the beat of any traditional drummer. Much of that is clear from a key interaction with one of the first human faces he engages with; during a closed-door interview with a military commander seeking cryptologists for a classified mission, dialogue contrasts personalities working from two opposing engines. It is not as obvious to Denniston (Charles Dance) that Alan is communicating from within altering mental patterns, but of course it isn’t: human psychology seemed like a fantasy to the populace of the 1930s, and poor Mr. Turning’s brilliant mind could hardly conceal him from the baffling dismissals of more socially mainstream observers. But most significant history hardly rests on the laurels of the common either, because if it did there would be scarcely a reason to contemplate our own place in a world built on the successes of outcasts. 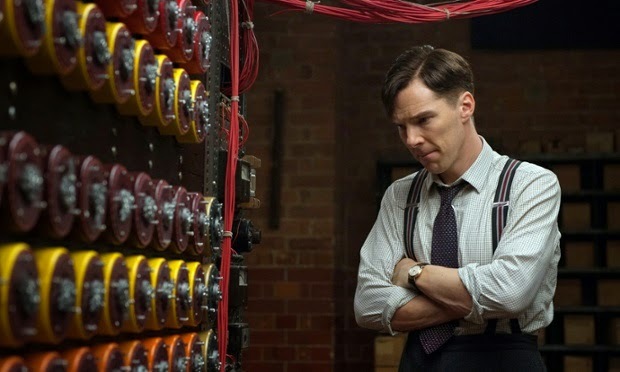 Few today will recognize Turing’s name in history lessons, and that reality is the prevalent undercurrent that drives “The Imitation Game,” a film about his important contributions to world prosperity. The necessity for this sort of character study is often decided by the ignorance of its audience, and in this case, I share in it; prior to seeing the film, I had no concept of who Alan was, or what made him such a significant person in the era of rampant fascism. After some additional research, it is not hard to understand why, either. Here was a man of gifted insight whose internal struggles – and ambiguous sexuality – became the means to which the British government could sweep his war record under the rug, and for well over fifty years his significance passed into obscurity. When intelligence records were declassified in the 1990s, only did then the question of his identity become synonymous with one of the greatest war-time achievements: the breaking of the German “Enigma Code.” This is a movie that brings those realizations to the forefront, in a very thoughtful and bewildering drama about a man who was meant to do great things in a world that was not ready to accept his eccentricities. There is a lot to learn about Alan, and even more to admire once the layers are pulled back. He is played in the movie by Benedict Cumberbatch, himself an eccentric method performer whose embodiment of a slew of recent roles gives him formidable presence in a world overrun in new acting talents. A mathematics professor at Cambridge, he is hired in the early scenes by the British Intelligence Agency (along with a group of other would-be candidates) to study and break the ironclad code that the Germans have been using to send military orders. The government somehow managed to smuggle one of these elusive Enigma machines out of Berlin at the height of impending war (a prospect that could inspire an equally-fascinating movie, I reckon), and as the potential decoders gather around it to ponder the possibilities, it seems to reverberate with unspoken challenges. “There are 159 million possibilities here,” one of the team members indicates. By human capacity, that implies a room full of such men could never work through every possible combination in order to crack the mystery in a single lifetime, especially since the Germans reset it every day to keep its dynamic secrets. As the gathering men sweat over attempts to circumvent the machine in a collective descent into frustration, Alan finds a more direct solution: building a machine that could grind its way through memorizing the patterns in order to more quickly isolate possibilities. Such a goal was apparently a costly one, but try telling that to a determined mathematician: in a scene where he confronts Denniston with an absurd financial figure in order to build it, Denniston’s sarcastic retort that “only Churchill” would approve such an obscene number literally culminates with Turing seeking audience with the Prime Minister himself (the movie wisely keeps this encounter off-screen for some minor comedic effect). And as power passes to him in order to accomplish what he insists on, his peers develop a certain sense of spite even while quietly conceding that maybe, after ensuing years of development, the machine is the only possible way to get close to defeating the Germans. That of course also increases the necessity for other mathematically-sound contributors, and through that realization Alan comes to acquire the quick wits of Joan (Kiera Knightley), who shows up in his world after winning a contest he holds in the newspaper involving completing complex crossword puzzles. Any other movie but a straight character study would implore these devices to intensify dramatic tension, but “The Imitation Game” is more direct than that. It sees the details as pieces of a personality puzzle, and it shifts between times in order to provide us paths to a solution. It is usually from a suggestion of clarity to imply that a mind gifted at mathematical equations is far more advanced in certain motor functions while diminished in social ones, but does that ultimately come down to matters of conception, or can early experiences contribute? A series of flashbacks to Turing’s school years reveals critical sources while emphasizing subdued emotional points for a more morose flash-forward in the last act, and yet the screenplay Graham Moore finds remarkable focus in the narrative hop-scotch. Always in the presence of personalities that diminish or empathize, Turning develops facets with painstaking precision, and Cumberbatch’s heartbreaking performance is so on target that it never fails to inspire the deepest of emotional observations. So limited in many regards and yet often pointed (and arrogant) in a marriage of chaotic traits, this is a character who becomes a model projection of the insecurities we all must face in a moment of decisive opportunity. Tuning, alas, died of suicide just a decade after his contributions to British intelligence were swept under the rug, and one wonders how different things might have been had he been given a moment (even a brief one) to bask in the karmatic virtues of his endeavors. Would the world have known of his work sooner than fifty years later? Would he have preferred to remain thankless, especially considering how he valued his solitude? The fact that the questions creep into our minds so persistently through the movie are not so much indicators of historical intrigue as they are responses to thoroughly deep storytelling, and without Moore’s on-point screenplay there would be little cause to look behind the eccentric behaviors of its lead. “The Imitation Game” ponders Alan’s place in history with compassionate acknowledgment, convinced that he was born too early in time to be liberated from cultural barriers but thankful he existed in a moment that allowed his gifts to save us all from something even worse.